No one gets to clock out today. And hell, this is a story people are gonna tell. At many points in the show’s run, characters have had to step up, but never before have so many individuals been forced to find their inner courage in order to not only survive themselves, but to help the entire group as well. As the once safe haven of Alexandria is completely overrun by walkers, everyone from Eugene, Father Gabriel, Enid and Denise, to a number of the town’s residents, all pull themselves together when it’s needed the most, whether it takes some prodding from others, or just being inspired by others taking a stand. In a brilliant bit of storytelling, director Greg Nicotero cuts back and forth between Glenn trying to convince a hopeless Enid that the memory of loved ones is worth fighting and surviving for, while the escaped Wolf urges a terrified Denise to overcome her fears. As Glenn explains to Enid, regarding her parents, “They’re still here ’cause you’re still here.” And the Wolf tells Denise, “You’re right, I changed, and now I want to help you change.” Indeed, Enid then helps to save Maggie, while Denise is finally able to take charge when her medical skills are desperately needed. And even the lone Wolf steps up, twice, to protect Denise, ultimately to his own demise. Meanwhile, Father Gabriel, who has shown basically nothing but cowardice as he’s refused to come to grips with the world around him, comes forward to provide safety for little Judith when it’s deemed her presence could be a danger to the group. Promising Rick he’ll protect her at his church, Rick, who has held nothing but utter disdain for this man, finally gives him his trust. Under the circumstances, Rick has little choice, but it’s still a sudden turnaround for both of them. It wasn’t long ago that Father Gabriel was ratting out Rick and the rest to Deanna as evil, dangerous people. Now, as the circumstances suddenly seem clear, Father Gabriel has seen the light. 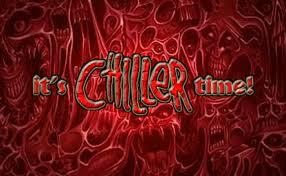 At the church, he tells the others who have sought refuge there, “Our prayers have been answered. God will save Alexandria, because God has given us the courage to save it ourselves.” He then grabs a machete and joins Rick and the others outside in killing as many walkers as possible. It’s a moment we couldn’t have imagined happening before, and it’s certainly one of the most significant character transformations other than that of Carol. Having a man of God among the group moving forward will also be compelling in these seemingly Godless times. Another individual who has only shown scattered bits of bravery in the past is one Eugene. He realizes they all have to come together in this hour of destiny. Despite Rosita’s declaration that he should stay behind as always, Eugene too enters the fray. 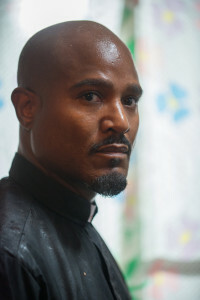 Morgan, who had previously deemed all life as precious, even the undead, also changes his tune after Carol pretty much scolds him for selfishly holding onto his beliefs for himself at the expense of the group. Finally, as Rick alone, and then Michonne, proceed to take out an inordinate number of walkers, the other townspeople, including Aaron, Spencer and Heath, all join the attack, in the most sharply edited sequence in the history of the show as everyone is shown slicing, chopping and stabbing their way through walker after walker. 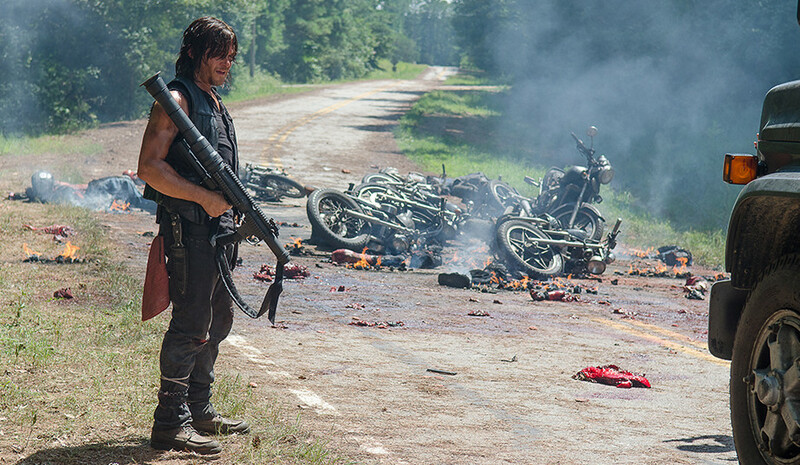 A fiery pool of fuel, courtesy of Daryl, ultimately finishes off the rest of the zombie herd. Speaking of Daryl, he really saved the day in this episode in more ways than one. In what was likely one of the most satisfying moments of the series, Daryl trades in his trusty crossbow (actually, it was taken from him) for a grenade launcher and literally blows up the entire Negan biker gang, whose leader was seconds away from shooting Abraham and Sasha dead. Those two, in turn ended up saving Glenn when it looked like he was toast (again!) by showing up in just the nick of time to gun down a mass of walkers that had Glenn surrounded, much to Maggie’s horror. While others were stepping up for the first time, it was Daryl as always, coming through again and again. No wonder he is such a fan favorite. Alas, while a number of beloved characters were spared death at the hands, or jaws, of gut-munching walkers, some weren’t so lucky. Jesse’s son, Sam, who at the end of the previous half-season cliffhanger, looked like he might be a liability, became just that. Deciding that being surrounded by such an abundance of the decrepit dead was too much for him, he ultimately became zombie fodder in a rare instance of the show depicting a child being eaten alive. Though it wasn’t nearly as graphic as poor Noah’s demise, it was startling, nonetheless. In complete shock at the horror she is witnessing, mom, Jesse, too succumbs to the mass of walkers. This temporarily freezes Rick before he gathers his senses in time to lop off Jesses’s arm as her hand was locked with Carl’s. Now Ron, having witnessed the rest of his family wiped out in an instant, grabs the gun lost in the ensuing chaos, and sets aim at Rick, before Michonne skewers him with her sword. However, a shot is fired, instead finding a target in Carl’s right eye. It is a completely harrowing sequence and if there was ever a show to make one need a drink, this is the one. And that brings us to the title of this article. 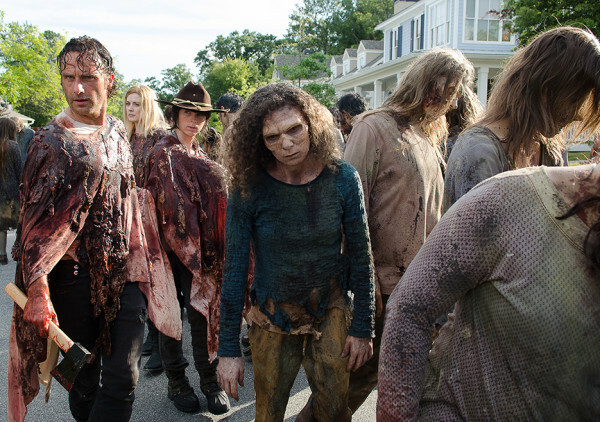 While the Gore 4, along with millions of fans around the world, love the show for its strong characters, as well as the thrills and chills of a post-apocalyptic, zombie-filled world, there is also an underlying sense of dread that clouds over the show from episode to episode. As we grow to care about these characters more and more, we also know that as the series carries on, much like in real life, we are going to have to at some point, deal with their deaths. While you can pretty much sit back and enjoy practically any other show with little fear of losing someone you love, with The Walking Dead, you know that almost anyone, other than Rick, and probably Daryl, are susceptible to seeing their end of days. Only Game of Thrones rivals Dead in this regard. But if you compare how many characters in each show have survived from the first episode to their most current, there is little competition. It makes for an edge-of-your-seat experience watching the show week to week. Just look at what the writers have done to our collective heart rates with Glenn this season. One of only a handful to survive from day one, it looked like Glenn was history, twice. But this is the sacrifice that us viewers make each week in order to enjoy such a suspense-filled, realistic depiction of life-and-death scenarios played out in a post-apocalyptic setting. As pointed out so cogently by the Gore4, The Walking Dead episode “No Way Out” is a bold testament to human perseverance. What this series has continually done on an abstract level is to dramatically magnify the everyday struggle for survival even as the world it depicts orbits death. The appeal of the show has never been on better display as Rick — proxy for the ‘Everyman’ — moves through the waking reality of a nightmare. Yet, in a way, is this not life itself? Hope becomes regret. Health becomes illness. Joy becomes remorse. Enthusiasm becomes entropy. Love becomes hate. And then, ultimately, life becomes death. It’s all on morbid display here. A one-to-one metaphorical mapping from the Walking Dead’s world to ours with Rick as our portal and avatar. Perhaps this is no better evidenced in the episode’s significant bookends: in the beginning, the literal, mental flashes of Jessie smiling as Rick’s object of desire while she’s being devoured; and Rick’s bedside prayer-wish for Carl and their future at the episode’s end. Media Vita in Morte Sumus — in the midst of life we are in death. Indeed. Peace, out. Hey, great encapsulation of the episode and the entire series itself. Six seasons in, and the show is showing no signs of wearing thin as it continues chronicling this band of survivors struggling to, not only survive, but also, to live and find peace in a very dangerous, violent world. There’s no reason The Walking Dead can’t keep going for a number of seasons more, especially since the comic book series it’s based on is a continuing effort as well. And, unlike Game of Thrones, where the TV adaptation has caught up to and passed the novels, The Walking Dead series is far behind the stories presented in the comics. Thus, it may be quite awhile before Rick truly finds the peace he is searching for.